On another note, I have designed a replacement for the RESET circuit that often fails in these games-much simpler as you replace a bunch of resistors and transistors with a single IC (called a CPU Supervisor), and cut and jumper a few traces. I shall expand that here in the future. To replace the ROM memory with a single EPROM (2764) all you need to do is first program the 2764 with the game code loading from 0000h up. Next bend out pins #20, 22, and 23 on the 2764. Then solder a jumper wire on pins #26, 27, 28 and 1 (tie all to 5VDC). Now refer to the photo to the left and add jumper wires from 2764-P2 to A12, 2764-P23 to A11, 2764-P22 to A15, and 2764-P20 to /MREQ. Works for me! Weird Solenoid or Lamp problems? Do you not get any sounds or are they mixed up, yet the MPU and Sound boards both seem to be ok? 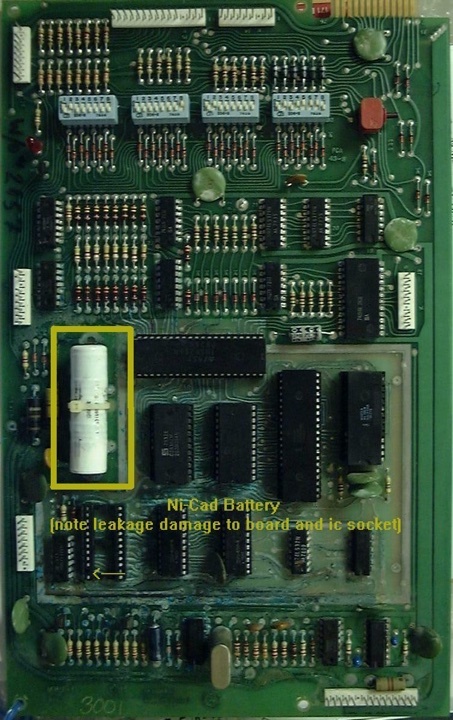 Then take a look at this capacitor - it might be broken or leaky. This capacitor is a critical timing capacitor. While you are in there if you have any switch matrix trouble then replace the 0.1 (104) capacitor just below and to the left of this. MPU-2 (and MPU-1) should look like this now. MPU-1 mods to topside of MPU - add 74(LS/HCT)04 (Piggy Back) on top of U5 (print out image). You need this inverter as there are no free gates left on the MPU-1 PCB, and we will need two inverter gates. 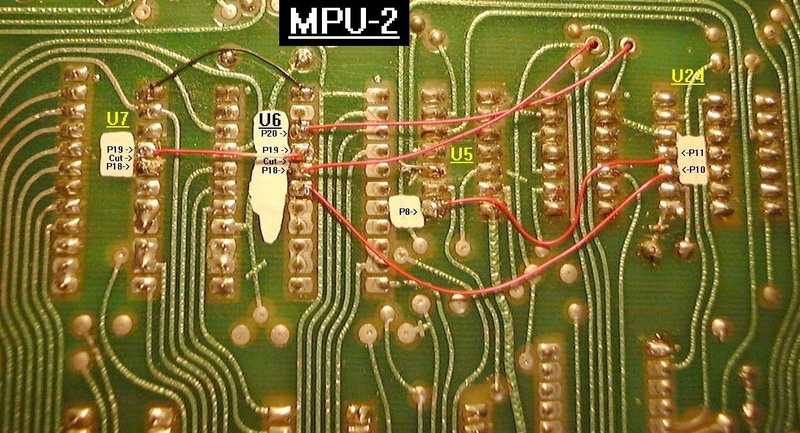 For the MPU-1 PCB you have to connect Pin 9 of the Piggy Back to U5-Pin 8, bend out Piggy Back-Pin 8 and add a jumper to the cut trace. This is almost identical to the MPU-2 mods except that MPU-2 has a spare inverter gate on U24 that we will use to invert U6/7-Pin17, thus we will only need one gate on the Piggy Back. 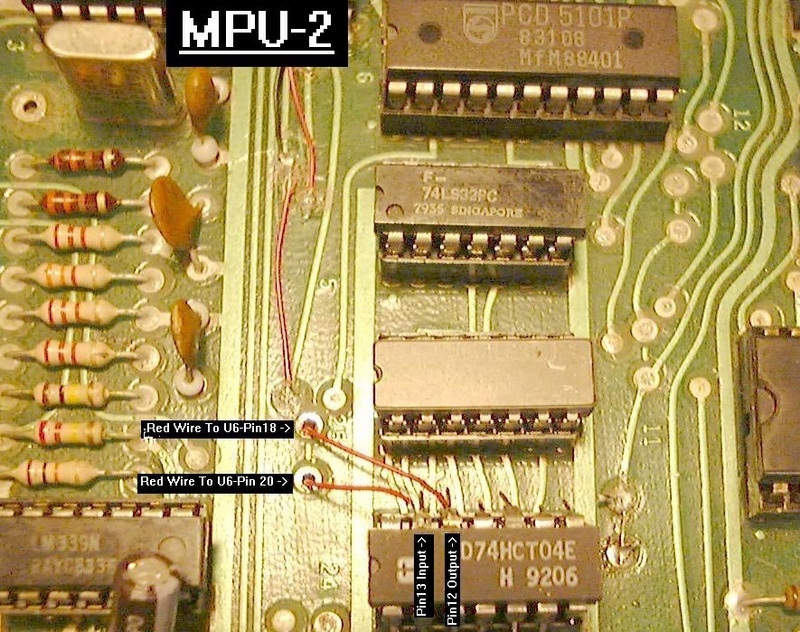 MPU-1 alternate picture showing cut trace at U5-Pin8 and jumper to Piggy Back-Pin 8 and jumpers to U6-pins 20 and 18 as described below. MPU-2 Now...(print out this image)...add jumpers between U6-Pin 20 and Piggy Back-Pin 11 (input), then jumper between U6-Pin 18 and Piggy Back-Pin 10 (output). This sets up the OE pin so it is the opposite of R/W. Add jumper between U6-Pin 19 and U7-Pin 19 (note that U6 & U7 Pin 18's are already connected with a trace on the top side of the PCB). 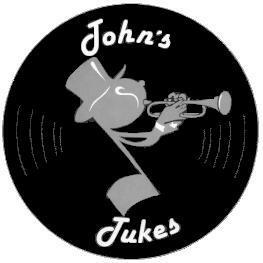 Next jumper U5-Pin 8 to U24-Pin 11, then jumper U24-Pin 10 to U6-Pin 17. MPU-2 Location of Piggy Back and the required connections. >>> Anyone have any thoughts? > switches do NOT work so leaving it off is really a bum option. 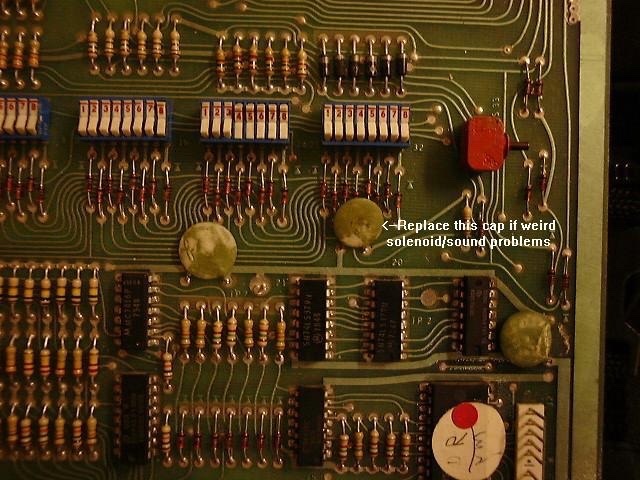 It looks like this circuit board is indeed designed to "catch" switches with short duration impulses using flip-flop logic that is tripped when a switch is closed and is reset when the next strobe pulse comes along. I checked the PCB on my working Super Nova and found the following pins (counting from the front of the cabinet to the back) are all High (roughly 5.0VDC) #1, 2, 3, 4 (could be pulsing), 5, 6 (Vcc) 8 (High pulsing low), and 9 (could be pulsing). Switch inputs are #1, 2, 3, and 5 - all should be High as the switches should be open. The common./ground pin is (of course) Low - #13 & #12 (no wire to 12). Pulsing pins are the Strobe Inputs - #7 (ST-0), #10 (ST-1), #14 (ST-2) and #15 (ST-3).